Reacquaint yourself with one of Hollywood’s greatest directors, the legendary George Stevens, who directed such classic films as Shane, A Place in the Sun, Giant (all included in AFI’s 100 Years … 100 Movies), and The Diary of Anne Frank. Stevens and his films have influenced generations of directors, most recently including Mike Nichols and Steven Spielberg. According to Entertainment Weekly, the Stevens musical Swing Time still ranks #39 — one spot above Schindler’s List — on the “100 Greatest Movies of All Time.” In “Giant: George Stevens, A Life on Film, ” Marilyn Moss gives a full bodied account of Stevens, the man behind the camera, as well as his relationships with the classic actors he directed, including Elizabeth Taylor, Montgomery Clift, Cary Grant, Katharine Hepburn and Spencer Tracy. In reading this colorful account of a director who worked in the classic days of Hollywood filmmaking, you’ll discover a revered artist who was a storyteller of great passion and intelligence. 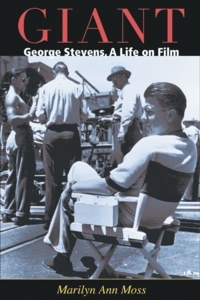 To purchase a copy of, or for more information on “Giant: George Stevens, A Life on Film,” click here.